This is one of my favourite work lunches. 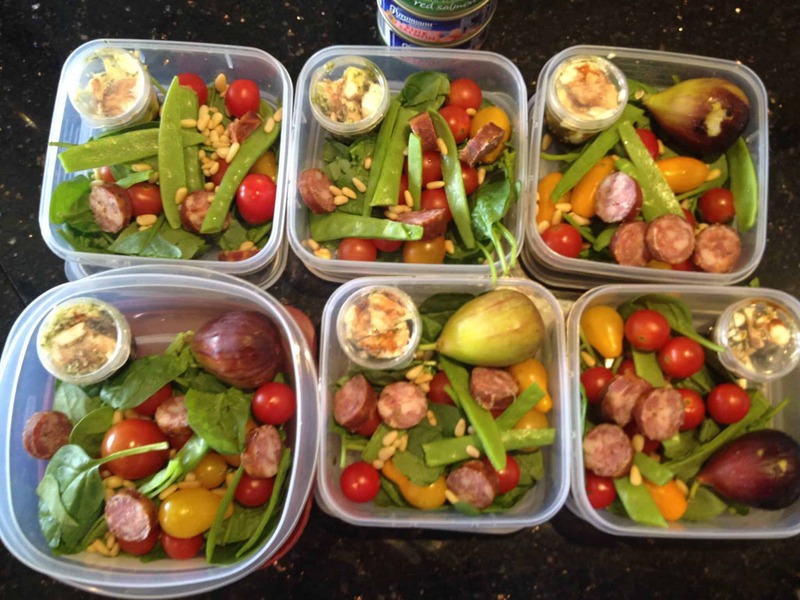 We often go to the markets on the weekend and then prepare a bunch of ready made lunches for the rest of the week. (note: by “we” I mean my amazing wife Monica who knows how to make healthy food look and taste incredible… I just tag along, take some photos and enjoy eating it). This one has chorizo, spinach, cherry tomatoes, beans and a fig. We will also make up some little containers of balsamic vinegar or olive oil with perhaps some feta cheese that you can add to it. At work I throw a can of salmon, tuna or sardines on it with some balsamic vinegar and viola a spectacularly yummy lunch! This meal does well on the nutritional completeness, both in terms of vitamins and amino acids. More recently I’ve started having sardines instead of the salmon because it’s cheaper and even more nutrient dense. Together with the salad it gives an even higher protein score. Tuna is another option but it doesn’t do as well as the sardines or salmon on the vitamins and minerals. Sometimes when we don’t get around to doing the salads or taking a lunch I’ll just grab a quick can of the sardines which I’ve grown to like by themselves these days. They’re filling, cheap and pack quite a nutritional punch all by themselves. sure not the cheapest, are imported to Australia mainly to be used in restaurants of Frank Camorra Movida in Melbourne and should be available in good shops in your area. I purchase always the box of 25 cans because it is close to 50% off. What is the food tracking system that you use? I like all the detail!